You see, Ray just beat down, in court, Hillary Clinton, the State Department, and a small part of Post-Constitutional America. Ray McGovern was put on the State Department’s Diplomatic Security BOLO list– Be On the Look Out– one of a series of proliferating government watch lists. What McGovern did to end up on Diplomatic Security’s dangerous persons list and how he got off the list are a tale of our era, Post-Constitutional America. In 2011, at George Washington University during a public event where Clinton was speaking, McGovern stood up and turned his back to the stage. He did not say a word, or otherwise disrupt anything. University cops grabbed McGovern in a headlock and by his arms and dragged him out of the auditorium by force, their actions directed from the side by a man whose name is redacted from public records. 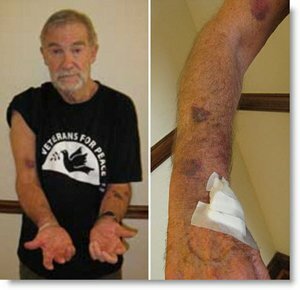 Photos (above) of the then-71 year old McGovern taken at the time of his arrest show the multiple bruises and contusions he suffered while being arrested. He was secured to a metal chair with two sets of handcuffs. McGovern was at first refused medical care for the bleeding caused by the handcuffs. It is easy to invoke the words thug, bully, goon. Ray McGovern is not the kind of guy to be stopped and frisked based State Department retaliation for exercising his First Amendment rights in Post-Constitution America. He sued, and won. The Partnership for Civil Justice Fund took up the case pro bono on Ray’s behalf, suing the State Department. They first had to file a Freedom of Information Act demand to even get ahold of the internal State Department justifications for the BOLO, learning that despite all charges having been dropped against McGovern and despite having determined that he engaged in no criminal activity, the Department of State went on to open an investigation into McGovern, including his political beliefs, activities, statements and associations. The first is that it is anonymous interests, within a vast array of government agencies, that put you on some list. You may not know what you did to be “nominated,” and you may not even know you are on a list until you are denied boarding or stopped and frisked at a public event. Placement on some watchlist is done without regard to– and often in overt conflict with– your Constitutional rights. Placement on a list rarely has anything to do with having committed any actual crime; it is based on the government’s supposition that you are a potential threat, that you may commit a crime despite there being no evidence that you are planning one. Full Discloure: I do know and respect Ray McGovern, and was once the subject of a State Department Be On the Lookout Alert myself, following these remarks I made about Hillarly Clinton. I have been unable to ascertain the status of my own BOLO alert but believe it is no longer in force. The State Department refuses to disclose any information to me about my status.